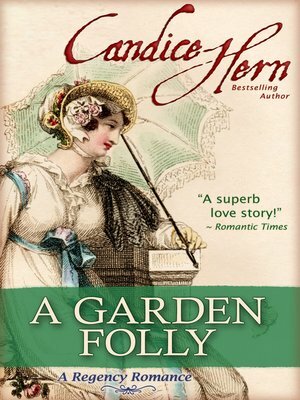 Fans of the traditional Regency Romances of Georgette Heyer, Barbara Metzger, and Carla Kelly will enjoy this witty Regency romp by New York Times bestselling author Candice Hern. Two sisters on the edge of poverty have a chance to meet wealthy, titled, unmarried gentlemen when they are unexpectedly invited to a month-long house party at a famous country estate owned by the Duke of Carlisle. Plans to find rich husbands fall apart when the beautiful, bubble-headed Susannah falls for the most unsuitable of suitors. Level-headed Catherine must save the family from ruin by securing a more fortunate match. Though courted by a wealthy earl, she finds herself falling for the handsome estate gardener and faced with the choice of marrying for money and security, or following her heart. Set at a grand country house and gardens reminiscent of Chatsworth, this sweet love story will sweep the reader away into a world of early 19th century wealth and aristocratic privilege, and just a bit of folly in the fabulous gardens.